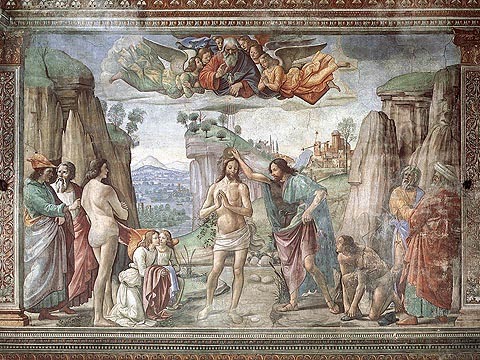 On the end wall of their chapel in Santa Maria Novella, Giovanni appears with his wife Francesca Pitti. 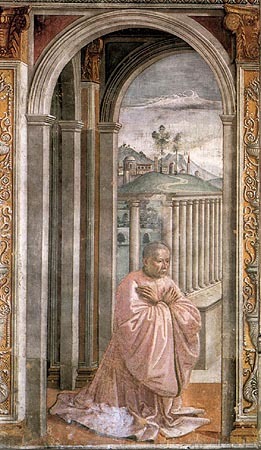 Both are simply dressed and are shown kneeling in prayer: Giovanni in three-quarter pose, hands crossed over his chest, his head bare, in a pale red robe. 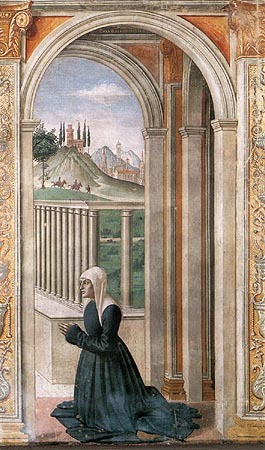 Francesca, who had died in childbirth in Rome in 1477 and had been buried in Santa Maria sopra Minerva, is shown in profile, hands joined, her clothing...a black gown without ornaments, with the veil worn by married women covering her head. 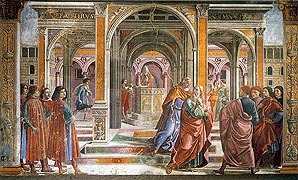 On the opposite wall, in the first narrative of the Life of the Virgin, Giovanni's son Lorenzo stands as a witness to Joachim being cast out of the Temple. 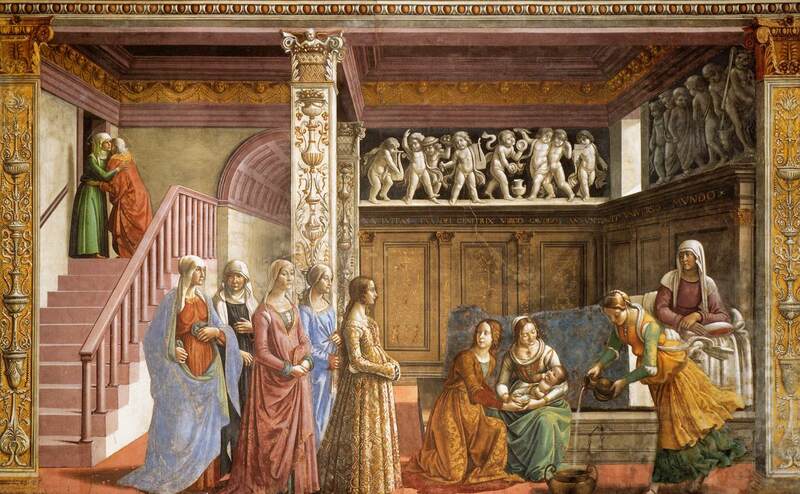 On the lower register of the opposite wall, as a witness to the Birth of the Virgin Mary which takes place in a contemporary Florentine bedroom, another young Tornabuoni woman, Lodovica, the only daughter of the patron stands in front of a group of companions. 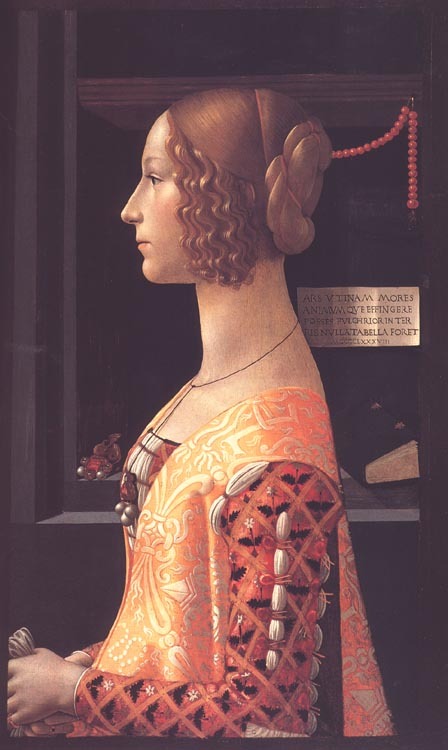 Her pose is almost identical to Giovanna degli Albizzi's and she wears a giornea of the same fabric and colour, decorated with the same heraldic motifs. 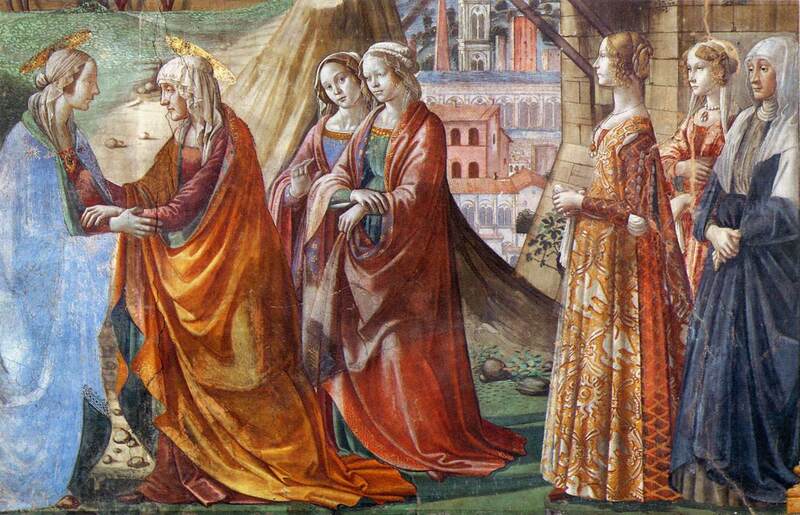 In 1490 Lodovica was only fourteen, and she appears to the viewer as the ideal young virginal girl, modest and beautiful. 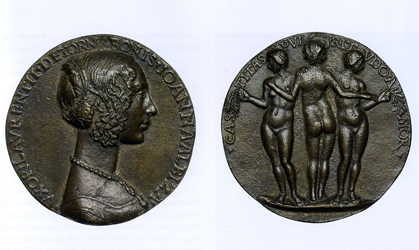 A younger version of her characteristic profile can be seen in a medal, almost certainly cast in 1486. On the reverse of the medal, a unicorn, symbol of virginity, kneels in front of a dove perched on a tree --and a dove on a branch /p. 71: is one of the motifs woven into her gold brocade gown. 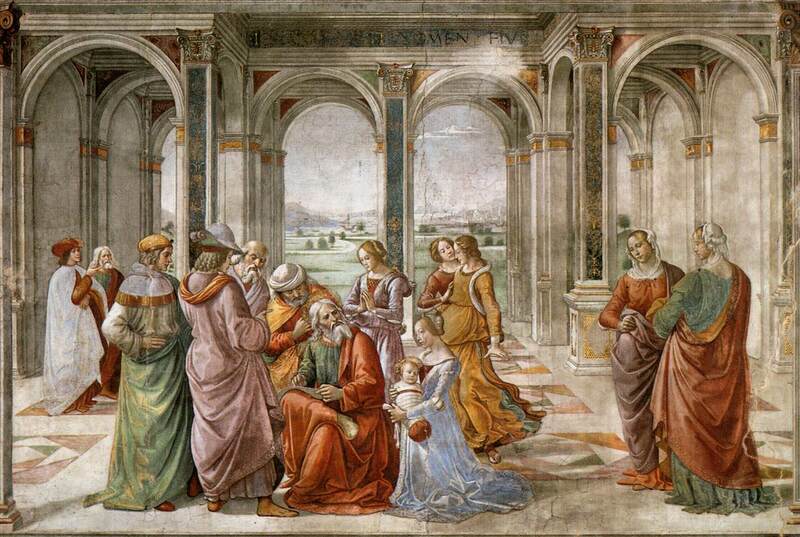 In 1491 Ludovica married Alessandro di Francesco Nasi, whose portrait is painted next to that of her brother Lorenzo in the Joachim story. 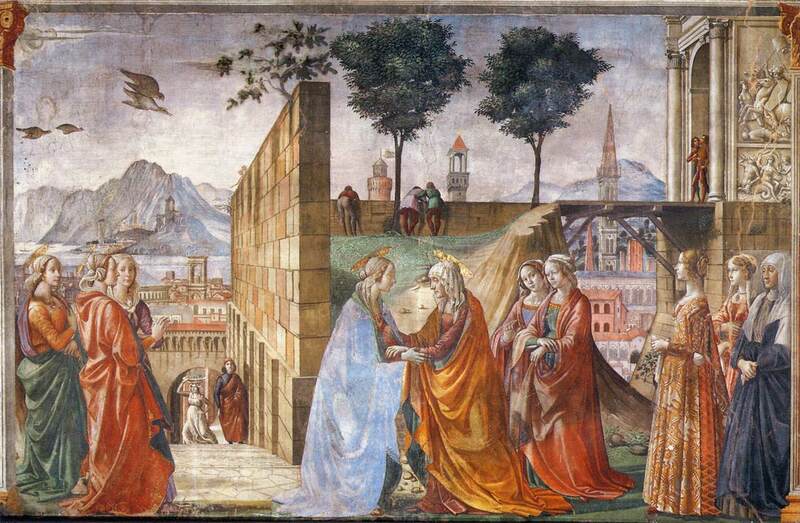 A third, unidentified, young woman stands almost at the centre of another story, the Birth of John the Baptist, on the second register of the right wall. This time her portrait is not in the usual profile pose: she turns her head and gaze towards the viewer, holding a handkerchief in her clasped hands, and wearing a pink giornea decorated with small gold motifs over a creamy cioppa embroidered with flowers and pomegranates. An ink study for the clothing of this figure in the British Museum shows the importance given to the accurate rendering of the details of her giornea, with its side openings cut into decorative leaf shapes and the sleeves of the cioppa slashed to show the thin fabric of the camicia. Behind this richly dressed young woman is a portait of an older woman, plainly dressed, which has been identified as /p. 72: the patron's sister, Lucrezia Tornabuoni. 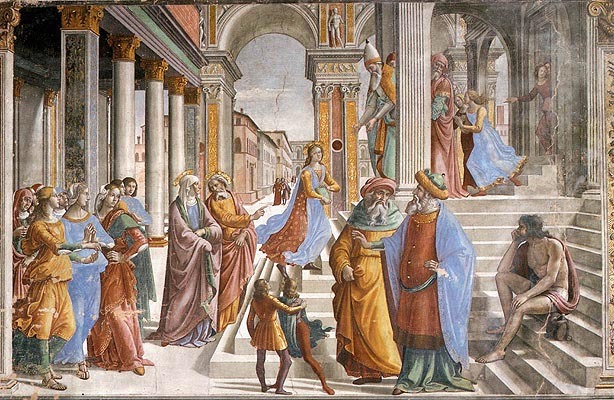 According to fifteenth century manuals on behaviour and manners, clothing had to be appropriate not only to social rank and income, but also to age. Lucrezia Tornabuoni, who belonged by marriage to the most powerful Florentine family, the Medici, plays here only a supporting role, with her simple gown almost hidden by a cloak and a white cloth which covers her head. The three young women, two shown in profile, one in three-quarter pose, attract the attention of the viewer because of their beauty and the richness of their gowns. They occupy a privileged place in the three stories in which they appear and which, appropriately, deal with pregnancy and birth. The way they have been represented, with their identical stance, the heavy garments which completely hide their bodies, their facial features idealised according to a similar type of beauty, and the absence of any gesture, contrasts with the simpler clothing, the more varied physical characteristics, ages and countenances of their companions. 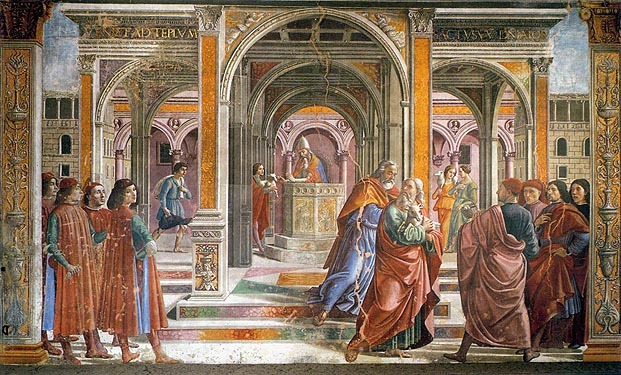 But there is an even more marked contrast, in these frescoes, between the representations of those women who stand as spectators, and which are recognisable as portraits, and the idealised figures who take part in the sacred narrative. 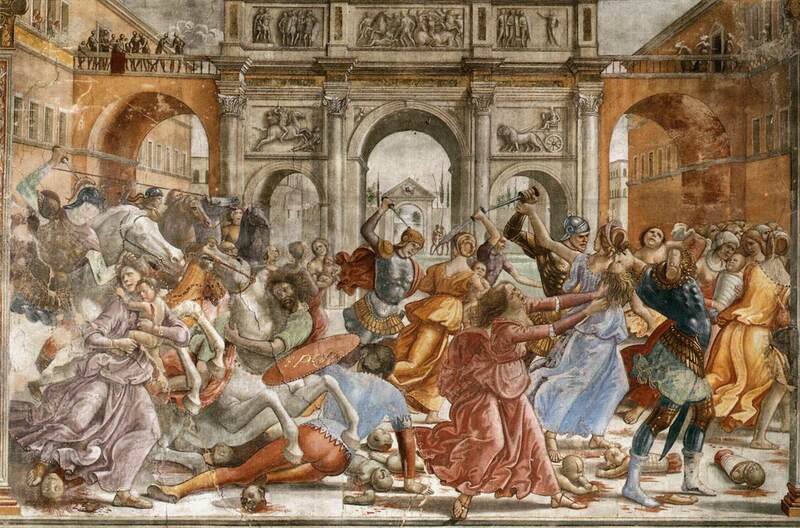 The latter show the use of a variety of gestures and facial expressions to communicate emotion and meaning appropriate to their role in the narrative. In the Birth of the Virgin Mary the woman who sits holding the baby smiles expressively while another, pouring water from a pitcher, steps forward with her clothes fluttering behind her, revealing her ankles. 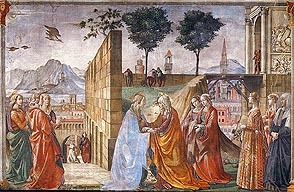 In the Birth of John the Baptist an attendant rushes through a door on the right, holding a tray of fruit over her head. Her light clothes reveal her figure, while a wisp of hair and a veil indicate the speed of her movement. The difference could not be more obvious: the slow and measured step of the 'real' women, and the absence of any gesture show the formality of an ideal mode of behaviour and a consciousness of social status, which is reinforced by the movements and the appearance of the fictitious characters. 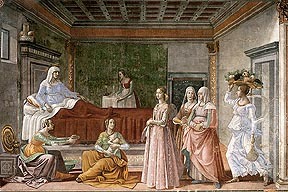 The images of the three young women are singled out by their place in the composition, by their appearance and behaviour. Beauty, demeanour and the wealth of their clothes mark them as belonging to a privileged group. These civic portraits speak of the different ideal roles for men and women. Gravitas and decorum are indispensable to both, but the similarities end there. The male portraits identify for the viewer the protagonists of the political organisation of the city, presented as the makers of social order and prosperity. The Florentine male elite proclaims the power which derives from family lineage and alliances, and their individualised features placed above the austere uniformity of their garments speak of an ideal world of civic virtue. The women, brides or brides-to-be, essential to their relatives' plans for the continuation of /p. 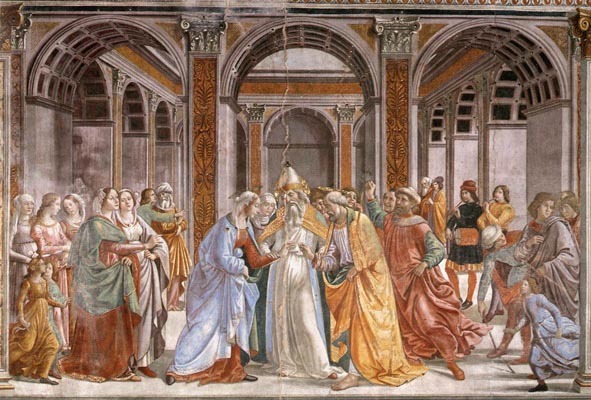 73: lineage, dressed in their opulent, expensive clothes, their necks decorated with jewels, their virtues signified by their measured step and by their folded hands, operate in a world concerned with marrige and childbirth. In the public space of the church of Santa Maria Novella, the frescoes commissioned by Giovanni Tornabuoni show how the representations of men and women follow different conventions which are regulated in part by social realities and in part by shared ideals. 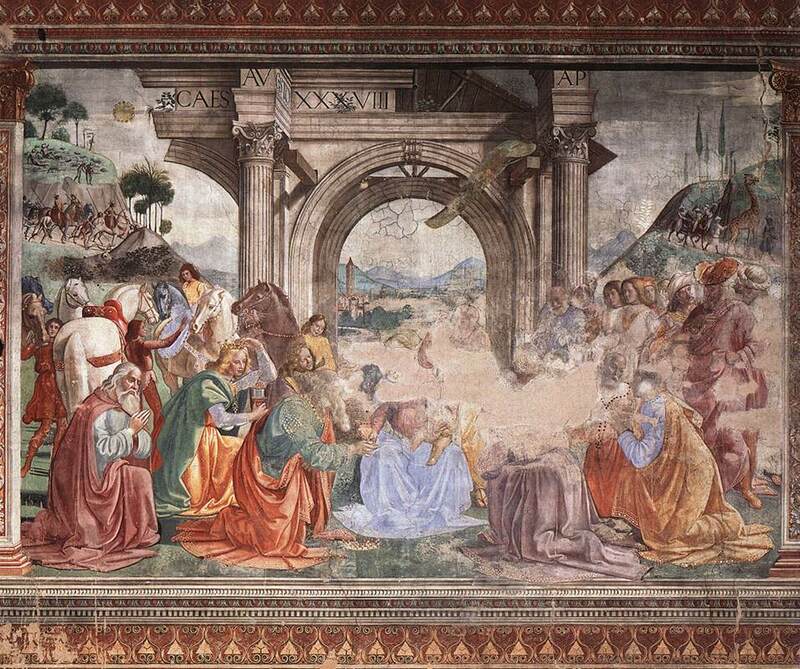 In the chapel..., Giovanni and [his wife] Francesca [di Luca Pitti] preside eternally over an affirmation of the continuity of life and the family and the city of Florence, represented by the scenes of the Birth of John the Baptist and from the life of the Virgin. 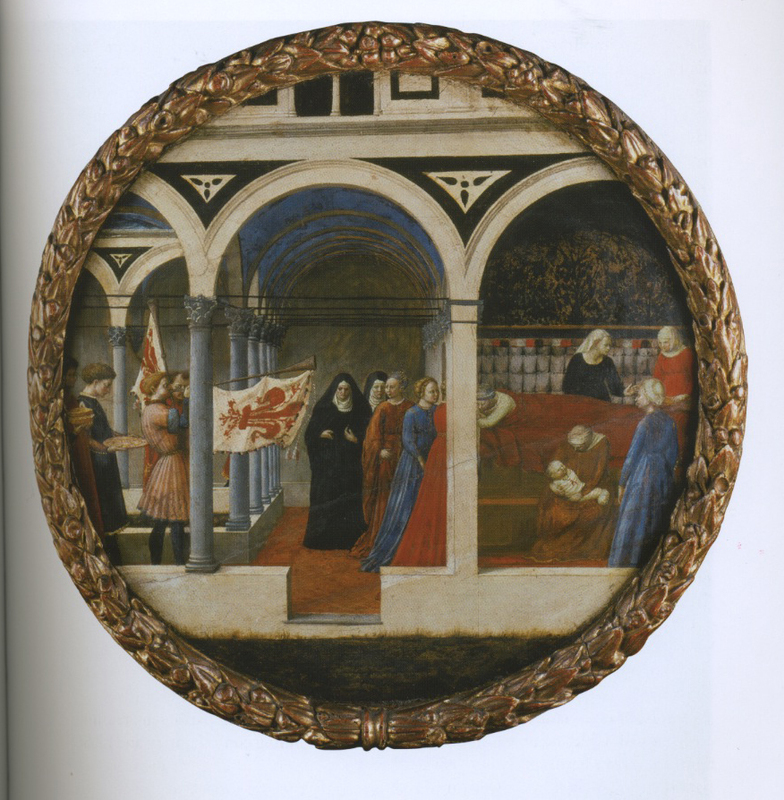 In these scenes, at once holy and domestic, may be identified the portraits of many of the Tornabuoni women, among them Giovanni's daughter Lodovica, attending at the Birth of the Virgin. 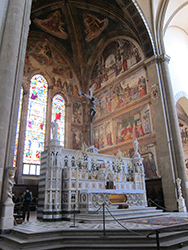 His sister Lucrezia Tournabuoni, patron of a chapel dedicated to the Visitation in the Medici parish church of San Lorenzo, may appear in the Tornabuoni Visitation, along with both the first and second wives of the patron's son Lorenzo. Lorenzo's first wife, Giovanna degli Albizzi, was portrayed after her death in a portrait by Ghirlandaio wearing the same dress as in the fresco and on a medal in the style of Niccolò Fiorentino. 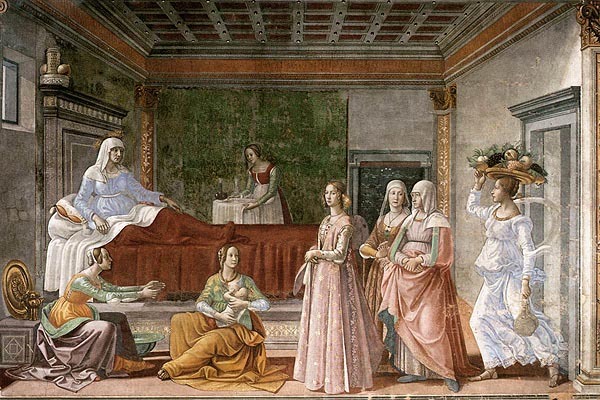 She may be identified alson in the Birth of John the Baptist, but by contrast with the Tornabuoni men, less on the basis of her features than by her distinctive pendant that appears in her commemorative portrait, and in both the chapel fresco panels. Inscribed on a building painted behind an image of St. Zacharias are the words "In the year 1490 when the most glorious city, renowned for its wealth, its victories, its art and architecture, lived in affluence, prosperity and peace." 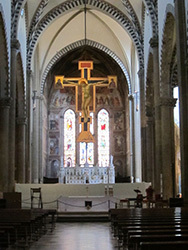 The architectural context with the vaulted ceiling and relief sculpture unmistakably draw connections to Roman architecture and sculpture. 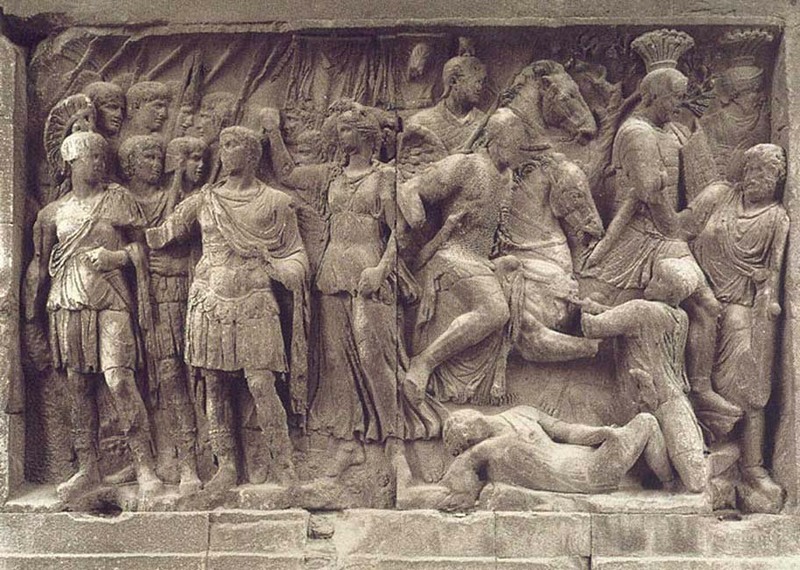 For example the relief sculptures come very close to a series of reliefs made for Marcus Aurelius. 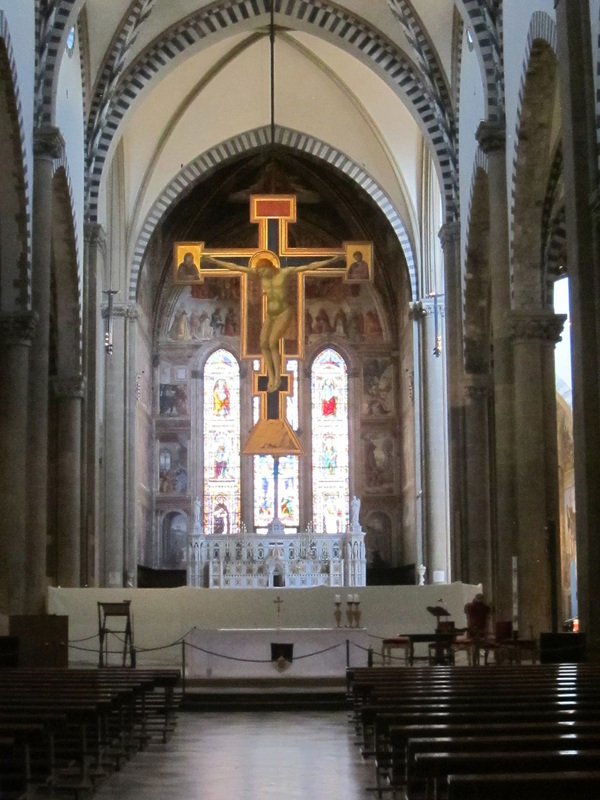 The point would not have been missed on a Florentine that Florence was being constructed as a new Rome. Is there a programatic relationship between the painted reliefs and the scene in front of it? 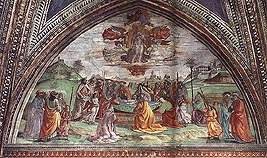 The angelic salutation to Zacharias appears to be echoed in the ad locutio gesture in the relief behind the group on the right. 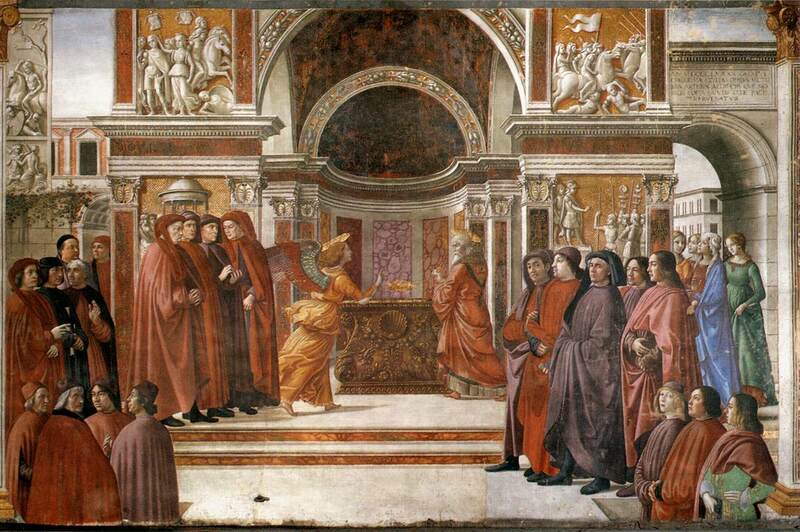 The relief in the upper right corner shows the crowning of an emperor by a Nike figure. 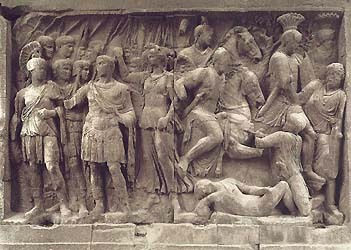 The scene is clearly modeled on The Great Trajanic Frieze. The Nike figure signifies divine sanction, and it is not by chance that this appears directly above the prominent members of the Tornabuoni family. 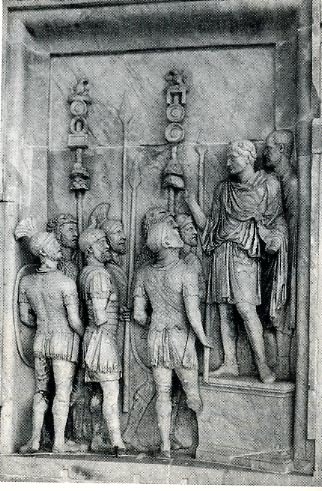 The inclusion of both the Trajanic and Aurelian reliefs on the Arch of Constantine would be of significance to the Florentine audience since Constantine was the first Christian Roman Emperor. 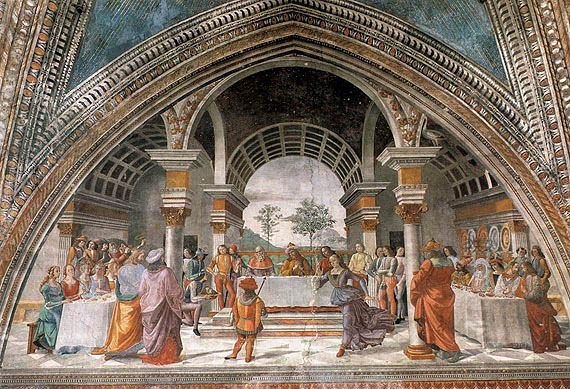 The fresco thus attests to the magnificence of Florence and the Tornabuoni family in particular.The lavish architectural context based on Roman monuments draws the comparison between ancient Rome and new building campaigns of Florence. A contemporary Florentine, Luca Landucci, kept in his diary a record of the magnificent new buildings and other projects underway. 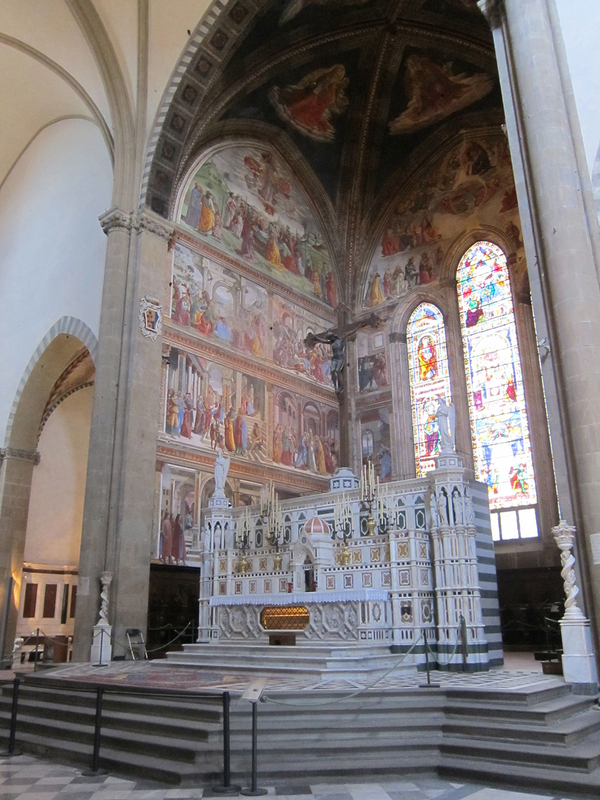 Included in this list is the Tornabuoni Chapel whose paintings alone cost the considerable sum of a 1,000 florins. 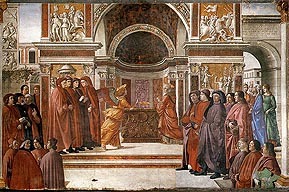 The red cloaks and caps of many of the prominent men attests to the importance of civic government and the important role the Tornabuoni family plays in the political life of the city. 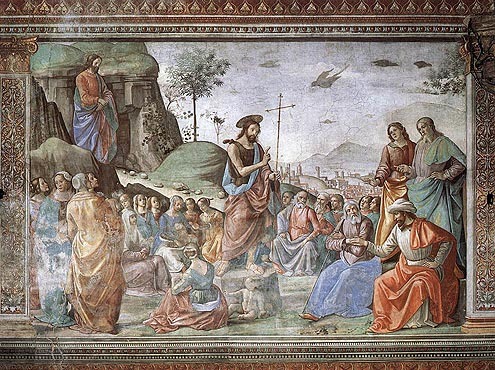 The intellectuals in the lower left corner signify the role cultural life and patronage plays in the enhancement of civic life. 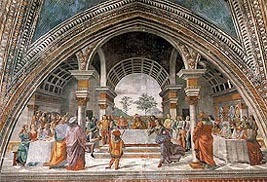 The patriarchal nature of this civic world is suggested by the positioning of some of the Tornabuoni women under the arch on the right hand side of the fresco, on the margins of the civic space. 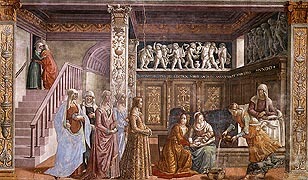 Excerpts from the artist's contract: "he [Domenico Ghirlandaio] is to paint and depict figures, buildings, castles, cities, mountains, hills, plains, water, rocks, garments, birds and beasts, of whatever kind as seems proper to the said Giovanni, but according to the stipulation of colours and gold as laid down above; and he should apply and paint all the arms which the said Giovanni should require on any part according to his own wish and pleasure." "to the praise, magnitude, and honour of Almighty God and His glorious Mother, ever Virgin, and of St John, St Dominic and other saints as detailed below, and of the whole host of heaven, the magnificent and noble Giovanni, son of Francesco Tornabuoni, citizen and merchant of Florence, has proposed, as patron of the greater chapel in the church of S. Maria Novella in Florence, to decorate the said chapel with noble, worthy, exquisite and decorative paintings at his own expense as an act of piety and love of God, to the exaltation of his house and family and the enhancement of the said church and chapel."